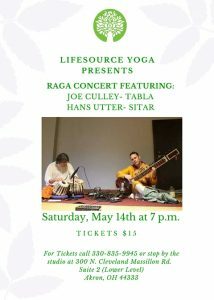 Please join us at Lifesource Yoga on Saturday, May 14 at 7:00 p.m. as we proudly present a raga performance by Hans Utter & Joe Culley. Tickets are $15. Call or stop by the studio for more information or, to purchase tickets. The word “raga” comes from the Sanskrit, meaning “color” or passion”, and this style of music plays a major role in Indian music theory. In Northern India, ragas are most often classified according to characteristics such as mood, season and time; in southern India, ragas are often grouped by the technical traits of their scales. Traditionally, ragas were linked to specific times of day or seasons of the year and were thought by some to have supernatural effects such as bringing rain. While these traditional associations are maintained by some musicians, seasonal & time restrictions are largely ignored in modern performance. This is a unique opportunity to spend an evening experiencing something new & truly amazing!